The second half of my second trimester of pregnancy has been good to me. After a rough start, I can finally hold down food without the aid of modern medicine, I have a great deal more energy, and best of all, I’m able to stay awake past 8 PM. I’m not sure what the next couple of months will hold, but for the time being, life rocks. While the good spirits are running high, I plan on cramming in as much good eating and restaurant explorations as possible. For our first dinner out on the town in a few months, The Astronomer and I made it a priority to check out Chef Roy Choi’s Commissary, his latest (and final) dining venue at The Line Hotel in Koreatown. 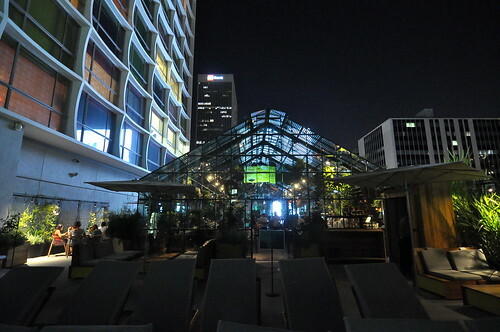 Located on the hotel’s second floor rooftop, Commissary is a greenhouse with a focus on fruits and vegetables. Roy’s been layin’ off meat for years now, and Commissary is a reflection of how delicious and satisfying a plant-based (but not necessarily vegetarian) diet can be at its best. 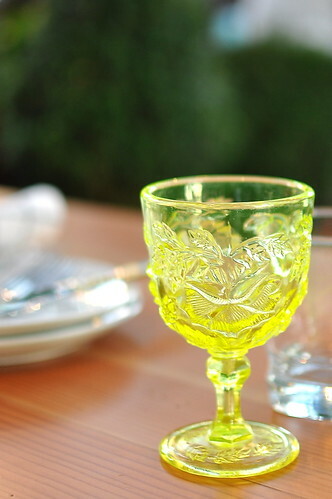 The restaurant’s space is full of light: pure sunshine during the day and urban twinkly at night. There’s a shimmering pool nearby and superb vibes all around. 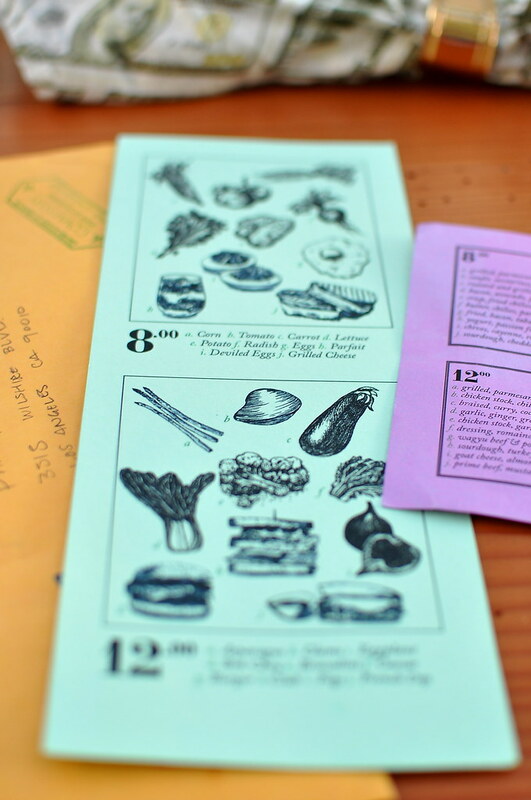 The restaurant’s illustrated menu (see topmost image) is divided into five price points and comes with a supplementary decoder to describe various preparations and additional ingredients. 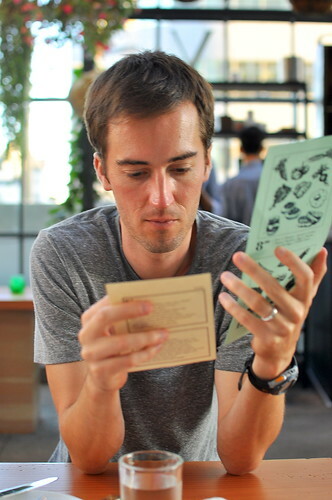 The Astronomer and I both found the menu to be whimsical and fun, even though it wasn’t the most streamlined. Our waitress suggested two to three dishes per person, but we went ahead and ordered five plates each because everything on the menu sounded so dang good. 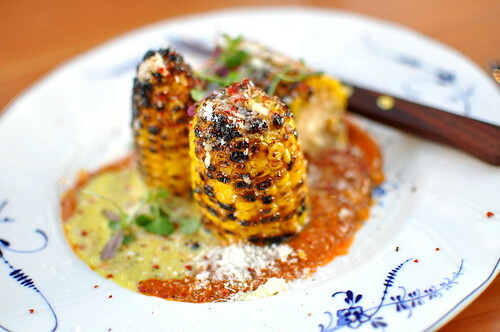 First up was the Corn ($8), beautifully grilled, dusted with Parmesan and kochukaru (crushed red chili pepper), and sitting pretty in “Yellow Sauce” (onion, soy) and “Red Sauce” (chiles, garlic, onion). We carefully removed the kernels, swished ’em about in the sauces, and went to town. 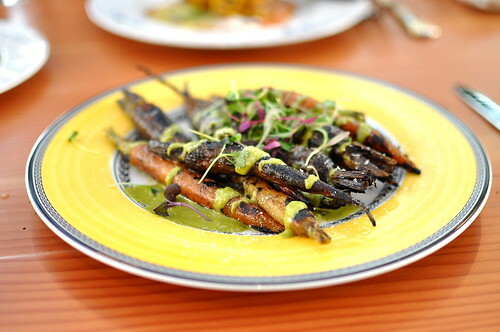 The Astronomer and I adored the roasted and grilled Carrots ($8), especially the delectable “Green Sauce” drizzled atop. A distant cousin of basil pesto, the “Green Sauce” stole The Astronomer’s heart and mind this evening. What’s in it, Roy? 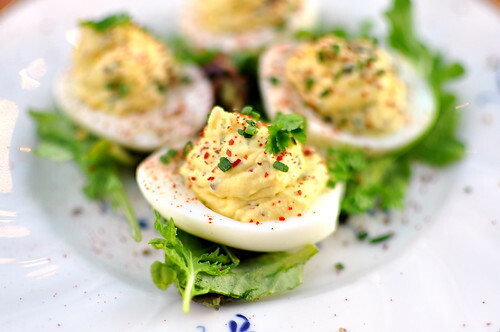 I handled the Deviled Eggs ($8) all by myself. Commissary’s straightforward preparation included mayonnaise, of course, along with cayenne, sweet relish, red onion, and chives. I can never resist these things. 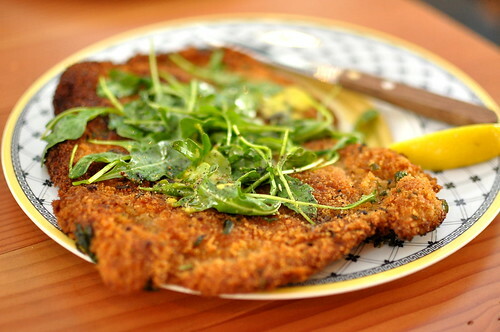 For our sole large-format protein of the meal, we chose the Schnitzel ($20). Pounded thin, breaded, and then fried, the pork arrived crispy, well-seasoned, and accompanied by Dijon mustard, “Yellow Sauce,” and arugula. A squeeze of fresh lemon juice and this cutlet was good to go! Hitting a different note from the rest of our spread was the braised Eggplant curry ($12) with deep-fried shallots and a whole lot of chilies. We ordered a side of brown rice ($3) to soak up the addictive coconut milk broth. This dish had a lot of soul—so hearty, so fabulous. 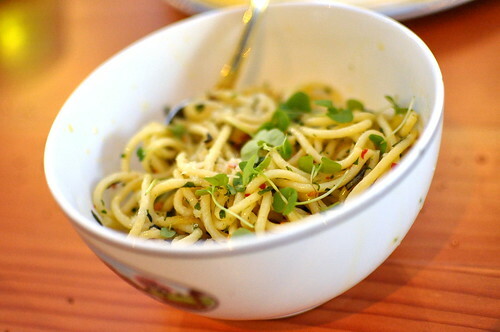 And then there was Pasta ($15), a petite bowl of house-made spaghetti mingling with garlic, lemon, and chilies. Our forks twirled and twirled until there was no more left. 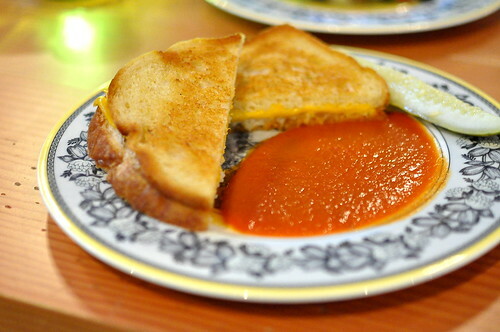 The Grilled Cheese ($8) on sourdough was simply stupendous. We’ve been dying for a taste of this ultimate comfort food since watching the movie Chef a few months back—the scenes where Roy coaches Jon Favreau on how to construct the Platonic ideal were mouthwatering. The bread, buttered, crisp, and golden, played a fine foil to the gooey cheddar. I need another one of these, stat. 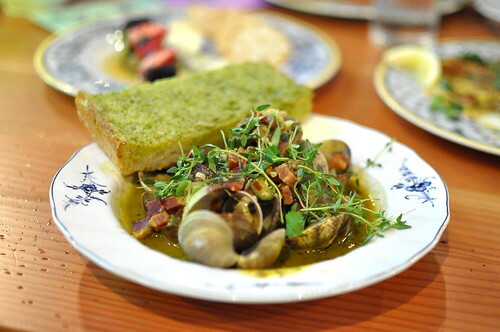 Our final savory dish was the Clams ($12), bathed in chicken stock along with chilies, lemon, bacon, and sambal. Toasted bread, slathered in “Green Sauce,” was served on the side. 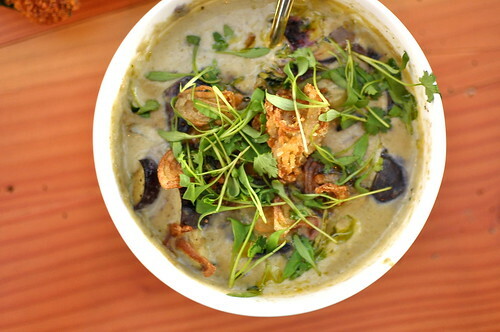 The broth tasted vaguely familiar and yet blew us away with its complexity—slurpable-to-the-max. To finish, we shared a Fruit and Cheese Plate ($15) that included brie, blue, and manchego. 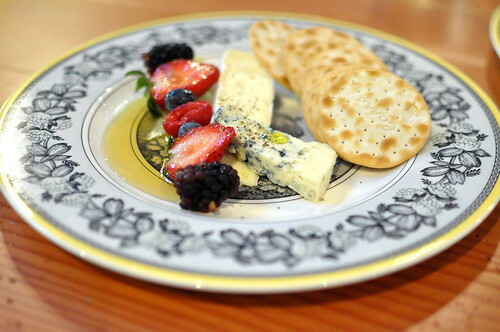 A pool of honey, plain crackers, and a spear of berries accompanied the cheeses. 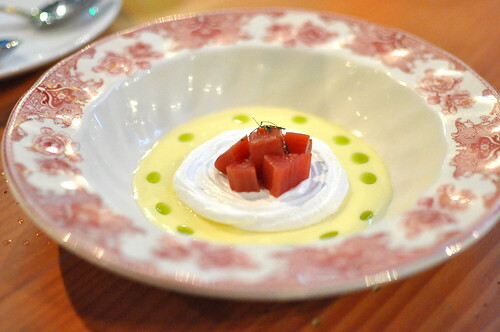 And finally, a refreshing rhubarb number with a meringue base and lemon anglaise. 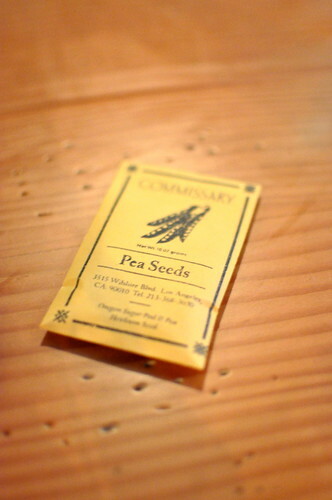 We were sent home seriously stuffed and with a package of seeds. I loved how our meal at Commissary featured a parade of seemingly random but wholly delicious dishes. Nowhere else in the city, or probably on the planet for that matter, could one find spicy curries playing harmoniously alongside deviled eggs, Schnitzel, and grilled cheese sandwiches! Here at Commissary, it just makes good sense (and great cooking). This place is my new favorite. I love it so. This is a menu I can definitely get down with – all of those dishes sound right up the DTAB alley!